PanARMENIAN.Net - Deputy Foreign Minister of Russia Grigory Karasin has spoken about the upcoming meetings of the leaders of Armenia and Azerbaijan Nikol Pashinyan and Ilham Aliyev, as well as meetings of the Foreign Ministers of the two countries Zohrab Mnatsakanyan and Elmar Mammadyarov. According to Karasin, the co-chairs of the OSCE Minsk Group are working on new meetings of the leaders of the two countries. 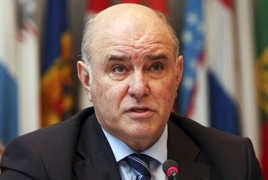 “New meetings are ahead, I understand at different levels - at the level of leaders of the countries and at the level of Foreign Ministers," Karasin was quoted as saying by RFE/RL Armenian Service. "Meetings should be well prepared to be substantive, bring real results and help the partied to move forward." He pointed to the need for predictability of the international situation around the Nagorno Karabakh issue.